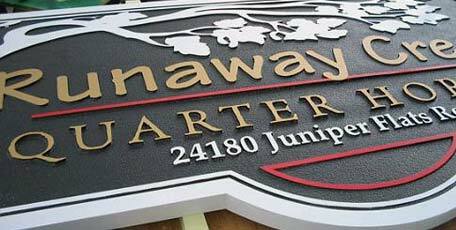 Sandblasted signs - Custom signs in HDU Sign Foam, wood signs, business signs, monuments, and other dimensional signage solutions. Sign Design and Fabrication presents SandBlasted.com. Our mission statement is very simple... to provide our customers with the most effective signage solutions for their marketing needs. We offer all in-house talent encompassing a variety of graphic fields. 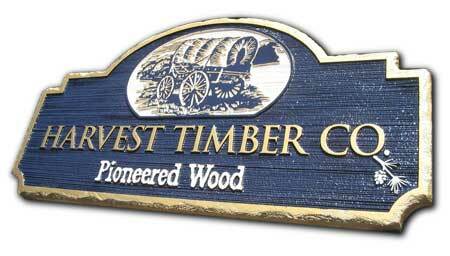 Sandblasted signs in high density urethane (HDU) Sign Foam and wood, CNC v-groove routed signs, custom business logo and lobby style displays, sign shields, awards, and plaques, and custom architectural monument signs. 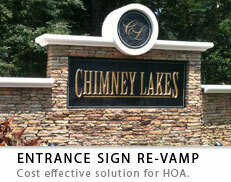 If you are in the market for an impressive dimensional sign, you have found the best the sign industry has to offer. that will make a lasting impression. Click Here to search our site on Google, or use the Form below to search our site with AutoMapIt.com. Custom logo signs and corporate identity displays. CNC v-groove routed signs in HDU Sign Foam. Military emblems made into 3D signs and plaques.